The Piolets d’Or try to bring to the stage a superb representation from the previous year of bold, technical, innovative, imaginative climbing executed in what is felt to be the best possible style. There is also the question of commitment and it is notable that the main ascents awarded this year went over the summit, descending by a different route, in one case over completely unknown ground. Only two awards have been made in 2017, one to the route by AC members Nick Bullock and Paul Ramsden on the 1600m north face of the 7046m southeast summit of Nyanchen Tanglha in Tibet. This was highly exploratory technical climbing (ED+) with a tricky descent, in poor weather, of the previously untouched east ridge into a completely different valley system. 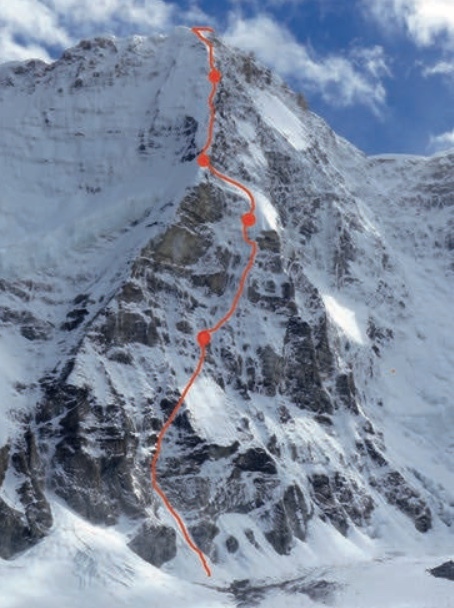 The second award is the North Buttress of 6904m Thalay Sagar in the Indian Gangotri by the Russian team of Dmitry Golovchenko, Dmitry Grigoriev and Sergey Nilov. The jury also announced two special mentions: a new route on the south face of Gangapurna (7455m) by Cho Seok-mun, Kim Chang-ho and Park Joung-yong of Korea, and the complete Torres Traverse, in a single day by Colin Haley and Alex Honnold of USA.